Today Develop uploaded a magazine which contains the top 100 game developers you should be keeping an eye on this year. The magazine spotlights companies from all around the globe working on projects for a wide range of platforms. 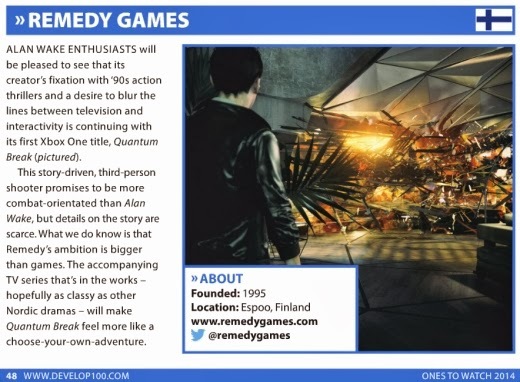 Included on the list is Remedy with Quantum Break. Selected by the Develop team, this covers games developers with groundbreaking titles that are expected to shake up the market, tools providers that are opening new possibilities for studios everywhere and educational institutions that are rethinking the way we prepare the next generation of development talent. The magazine is available for free and you can read it in your browser or on an iPad. For more details, and to read the issue, click HERE.